You may have heard of ductless mini splits. Ductless heating and cooling is popular in Europe and Japan, and is now making inroads here in the US. If you’re thinking of installing a new cooling system before the major summer heat arrives, going ductless might be a good option. But ductless mini split heat pumps (that’s another term for them) are not ideal for every home. The best way to find out if ductless cooling is ideal for your situation is to call our professionals. But we can give you some help right here to help you start thinking about whether you should get a ductless or standard split system air conditioner. Ductless air conditioners, like all systems, have a natural lifespan. There will come a point when no matter how well you’ve taken care of it, you’ll have to replace your ductless system. 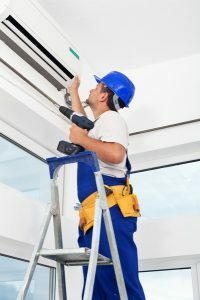 What is important is that you recognize the signs that your ductless air conditioner is nearing the end of its lifespan. That way, you can have it replaced before it gives out on you. Let’s take a look at some of the signs that your ductless air conditioner needs to be replaced. Traditional air conditioning systems need ductwork to deliver cool air. In an effort to help cool ductless commercial spaces, ductless air conditioning was developed. This innovation has now moved into residential spaces, offering non-ducted homes the possibility of having manageable, efficient, whole-home air conditioning during the summer months. So how exactly does ductless air conditioning work? Here’s an overview from our Jacksonville ductless air conditioning experts at Touchstone Heating and Air, Inc. The condenser and compressor are housed in an outdoor unit, very similar to that of a standard split-system air conditioner, and it functions in almost the same way, delivering refrigerant to the indoor air blower. Each ductless system has at least one indoor air blower, if not several, to which the outdoor unit is attached. The evaporator coils are housed in the inside blower unit, along with a fan and the system’s air filter. In a standard split-system air conditioner, the evaporator unit is also indoors, but is usually larger and part of the heating system. This is one of the main differences between a ducted system and a ductless one. The indoor blowers and outdoor unit are connected via a conduit placed between them through an exterior wall. This conduit holds a power cable, refrigerant line, suction tubing and a condensate drain. The indoor blowers are mounted and then connected to the outdoor unit. Each blower is programmable. When the temperature in a room becomes higher than the temperature set on the blower, the system turns on: the outside compressor is activated and refrigerant begins to circulate. The refrigerant passes through the compressor, releases its heat through the condenser and then flows to the indoor air blower where it begins to circulate through the evaporator coils. The fan of the indoor blower turns on, blows over the evaporator coils and sends cool air into the room. While it seems that these units simply blow cool air into the space, what they actually do is remove the heat and humidity from the room, run it through the system, and bring it back into the room as cool dry air. 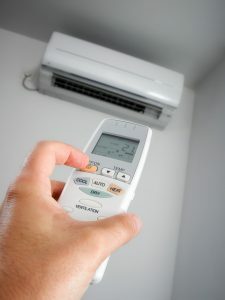 Is a Ductless Air Conditioner Right for Me? Choosing an air conditioner that works best for your property is a multi-step endeavor that should be handled with the help of a trained professional. Any of our experts at Touchstone Heating and Air, Inc., are happy to answer any questions you may have about ductless air conditioning. If you think your property could benefit from ductless air conditioning in Jacksonville, FL, but you still have questions, call us today to get the answers you need.